This deal Frito-Lay Snack Bag Chips deal is even better now on Amazon! Hurry and get the Frito-Lay Classic Mix Variety Pack, 35 Count today for as low as $9.25 when you clip the new $1.50/1 coupon & choose Subscribe & Save with at least 5 subscriptions from Amazon! That’s only $.26 per snack bag!! Perfect for school lunches or afternoon snacks! Limit 4. Check out all of the Amazon deals here! If you prefer one-time purchase, clip the coupon & pay $11.15. Amazon Prime members get FREE 2-day shipping! If you are not a Prime member, get FREE shipping when you purchase $25 or more of eligible items across any product category. Check out the Frito-Lay Snack Bag Chips details below. Frito-Lay Classic Mix Multipack provides the perfect portion size and variety to keep your entire family happy. From the pantry to the lunch box, all you have to do is grab a pack and go! Frito-Lay’s Classic Mix Multipacks are easy to carry, easy to store and easy to pack- it’s the perfect staple for every pantry. 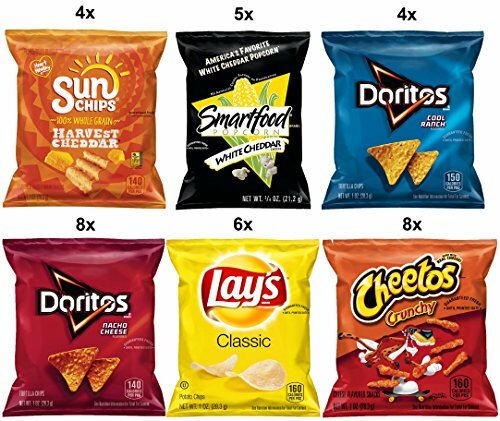 The Classic Mix Multipack features the following classic flavors: Smart food White Cheddar Popcorn, Cheetos Crunchy Cheese Snacks, Sun chips Harvest Cheddar Multigrain Chips, Lay’s Classic Potato Chips, Doritos Nacho Cheese, and Doritos Cool Ranch Flavored Tortilla Chips. Buy the Frito-Lay Classic Mix Variety Pack, 35 Count from Amazon.